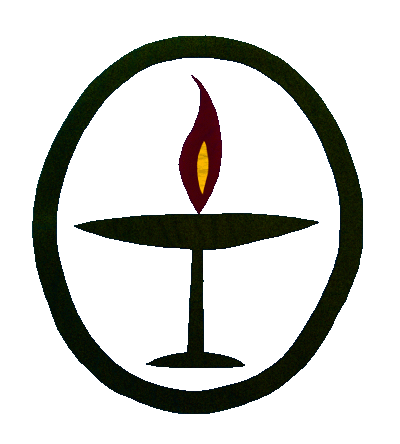 A flame within a chalice is the symbol of Unitarian Universalism. “At the opening of Unitarian Universalist worship services, many congregations light a flame inside a chalice. This flaming chalice has become a well-known symbol of our denomination. It unites our members in worship and symbolizes the spirit of our work. The lighting of the chalice is accompanied by a reading. The symbol had its origins in a logo designed by Austrian refugee Hans Deutsch for the Unitarian Service Committee (USC) (now the Unitarian Universalist Service Committee) during World War II. According to USC director Charles Joy, Deutsch took his inspiration from the chalices of oil burned on ancient Greek and Roman altars. It became an underground symbol in occupied Europe during World War II for assistance to help Unitarians, Jews, and other people escape Nazi persecution. After 1941, the flaming chalice symbol spread throughout Unitarianism in America and the rest of the world. This spread continued after Unitarians in North America merged with Universalists to form the Unitarian Universalist Association. 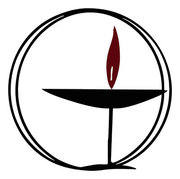 The symbol gradually became more than a printed logo. By the 1960s, people like Fred Weidman of Dearborn, Michigan, were making flaming chalice jewelry. Some congregations began displaying the symbol in their worship spaces. At some point, three-dimensional chalices were made to be lit during worship services, but the origin(s) of this usage remains obscure.